Almost four weeks ago I blogged about “Pitches,” in various forms. 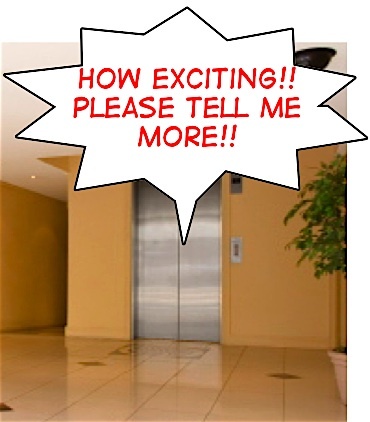 First there was the three minute pitch to an agent, which I think should probably be a 1 minute based on what I’ve read from agent blogs and rides in elevators. Then there’s the three sentence pitch and the 25 words or less pitch. I committed to creating sample pitches in each area and my 30 days are up tomorrow. So here goes and hope I get this in the ballpark. I’ll spare you the one to two minute one, because that’s almost 175 words. But I will post the three sentence and 25 words or less. No laughing, spewing or otherwise harming your computer screen, okay? After Lili Rivera’s 18 year marriage ends she creates a ‘vision board’ for a new life, look, and love. But the road to these goals hits a detour when she’s arrested for drunk driving and her ex-husband is a cop, his fiance a Deputy District Attorney, and Lili’s best friend lost her husband because of a drunk driver. Relationships are tested, secrets unfold, and Lili faces a full custody battle for her twin sons. What if you’re a single mom and a drunk driving arrest lands you in jail and your ex-husband is a cop? And/or should I work on it some more? The other part of today’s post is ‘sample character music.’ These are songs on the playlist compiled by my main character, the protagonist, Lili Rivera age forty something or other. She selected four songs and you should know that she’s totally old skool, she loves Oldies even if they were before her time. She let her best friend, Veronica (Vero for short) have three songs, because she likes Christian music and Lili isn’t all that fond of that genre but she’s trying to be a better friend. Her ex-husband Joe gets a big nada, but one of the songs does remind her of him. Guess which? In the meantime, enjoy the music and Lili will be back next Friday. I have to keep her away from those happy hours, tu sabes. Your pitches sound interesting. It's so hard to boil down to few words what a story, much less a book is about. I'd like to offer some thoughts. I suggest culling out some words to keep the flow clean. Maybe something like…. After Lili Rivera's 18 year marriage ends, she creates a 'vision board' for a new life, look, and love. But her ‘vision’ slams into an abrupt detour, when arrested for drunk driving, she must reckon with an ex-husband who’s a cop, his fiancé the Deputy District Attorney, and a best friend whose husband was killed by a drunk driver. Relationships are tested, secrets unfold, and Lili faces a full custody battle for her twin sons. Not clear how her ex being a cop relates to her dilemna. For instance, don’t know if he’s directly interfacing with her. He could be a cop in another state or county. So it’s not clear the immediate challenge. If he’s not the one arresting, but somehow you must reckon with him locally….the sentence would pack a punch if you added something about the challenge. What about him being a cop? There’s an implied relationship between him being a cop and the fact she was arrested…but I think adding something more to hook or highlight the threat. Excellent points! I appreciate your comments and I agree that the words you used “punched” up the description.Muchismas gracias.